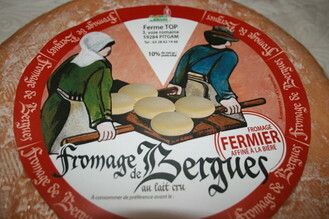 The Bergues is produced in a few farms around Bergues. It is a cheese made with raw milk partly skimmed, semi-hard or soft. Its ripening, which lasts for a minimum of three weeks, takes place in elevated cellars where it is washed with beer every day. It is then ready for tasting. The oldest written record of this cheese was found in the municipality archives of Bergues Saint-Winoc. In 1554, Van Meckeren, Vice-Admiral of Flanders, offered a bergues cheese to Philippe de Bèvres, Vice-Admiral of the sea. In 1804, there were 188 producers in 25 communes. In 1857, 100 tons of Bergues cheese were exchanged in Bergues, of which more than half was exported to Paris and the south of France.